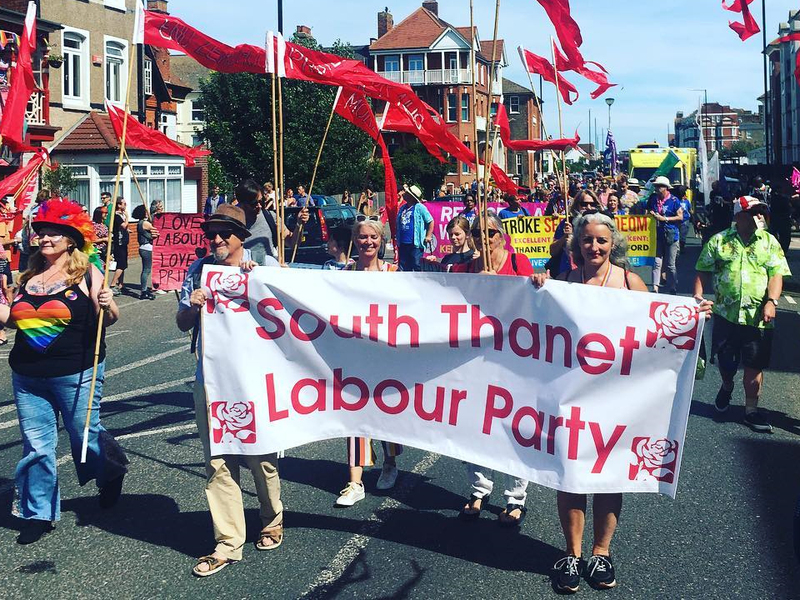 South Thanet Labour Party was out in force at Margate Pride, a great celebration of diversity in Thanet. The march, now in its third year, is dedicated to Lesbian, Gay, Bisexual, Transgender, Queer and Intersex Life. Waving red flags and dressed to impress, Labour Party members and supporters took part in the main parade and were greeted with cheers and chants of ‘Oh Jeremy Corbyn’. We marched alongside activists from Save Our NHS in Kent, several of whom are also Labour Party members. Many photographs were taken and shared on social media. We hosted a colourful stall in Marine Drive offering temporary tattoos in four different designs, bearing the message ‘Loud and Proud #Labour’. Also on the stall were leaflets outlining Labour’s progressive policies on LGBTQI rights and cards advising members of the public that the process for registering to vote has changed. We had lots of great conversations and listened to people’s concerns. South Thanet Labour Party’s presence at Pride was made possible through a rainbow-themed cocktail fundraiser at the home of our LGBT officer, Jane Hetherington, and through the hard work of our Campaigns Coordinator, Sarah Horan, our Vice Chair (Membership), Fiona Crawford, and the many members and supporters who came along on the day.